Theory is the distillation of history, and it is only by understanding the present that one is able to understand the past. With the working class and socIety at the stage where they are at present, all the great hIstorical events and ideas of the past need to be rewritten. CLR James, with Grace Boggs and Cornelius Castoriadis wrote this in 19581, after Hungarian workers had thrown up workers councils across Hungary during the 1956 uprising, without any revolutionary party to guide them. In Facing Reality, CLR James proposed new histories of the Russian Revolution emphasising the role of the factory committees, of the Levellers in the English Civil War, of the Enrages in the French Revolution, and of Black Americans during the American Civil War. James was politically active from the 1930s to the 1980s, and we are now as far from this period as CLR James was from the Russian Revolution. While James was writing about workers councils in the late ‘50s and early ‘60s, he was also writing about Kwame Nkrumah in Ghana and Eric Williams in Trinidad, both of whom he had mentored in the 1940s, but was critical of once they had assumed power. It is this period of anti-colonial struggle in sub-saharan Africa we revisit here, beginning with a summary of the previous and contemporary strike waves which have garnered considerably more attention. James wrote what remains the seminal history of the Haitian Revolution2. In he emphasises the role of black leaders like Toussaint Louverture as well as perhaps the first example of subaltern studies, long before it had a name, discussing the movements of slaves on the plantations, ex-slave maroon communities during the revolution, and the conflicts they came into with Toussaint’s army.The role of slaves and ex-slaves in Haiti, and of the sans-culottes in the French Revolution just a few years beforehand, mark some of the first signs of a proletarian politics that was to develop as a coherent tendency in the mid-19th Century. The Paris Commune of 1871 is hailed as the first workers insurrection, but apart from the slave uprisings and radical democratic movements that preceded it, it came alongside a wave of struggles internationally, from the American Civil War and Reconstruction in the Southern USA, to the 1876 ‘Year of Fire’ strike wave in the northern USA, to the Kabyle Revolt in France’s other major colony, Algeria, in 1871-72. While the centenary of the Russian Revolution was last year, it was part of an international wave of insurrectionary class struggle, which included Red Clydeside3, national rice riots and strike waves in Japan4, the German Revolution5, and the Seattle General Strike6, the period drawing to a definite close with the Spanish Civil War and the Second World War. The strike movements after WWII have received considerably less attention than the wave after WWI. In Europe and the US they didn’t approach the insurrectionary pitch of 1917-21, but there were nevertheless significant movements. Within two weeks of taking power, the 1945 Labour government sent troops to break a go-slow on the London docks, in what was to begin a six-year cycle of strike breaking against dock workers7. In Japan, under US occupation and with hoarding by the Zaibatsu (corporations), workers went on mass strike, but facing mass shortages of food and other necessities, everything from the Yomiuri newspaper to coal mines were taken over by workers and run under ‘production control’. Workers continued to work, but directed production themselves, ignoring ownership and senior management, although stopping short of full expropriation8. In Germany hundreds of thousands of workers were on strike in the Ruhr in 1947 and 19489. France saw insurrectionary strikes by workers at Renault, Paris in 1947 and a mass strike by coal miners in 1948. The Oakland General Strike took place in 1946. The Coal Miner’s general strike of 1949-1950 saw involvement from CLR James’ and Raya Dunayevska’s Johnson-Forest Tendency10. The strike wave arrived later in the Eastern Bloc, starting with the uprising of East German workers in 195311, Poznan in Poland 195612, Hungary 195613, Novercherkassk 196214 and Czechoslovakia 196815. Due to the massive questions thrown up by workers uprisings in socialist states, these have gained considerably more attention than the immediate post-war strike wave in the US and Western Europe, at least until Paris ‘68 and the Hot Autumn16 in Italy which mark the culmination of this period. Possibly the end of this wave could be marked with the revolution in Portugal 1974-76 against Salazar, where mass strikes and self-management in Portugal also precipitated the independence of Angola in 1975 after a ten year war of independence there. The strike movements faced opposition from both colonial governments, and often national liberation parties too. Colonial governments, famously the British17, destroyed reams of records during de-colonisation. Combined with media suppression of events at the time to prevent the spread of strike movements, this has meant that several histories of events have only been written a decade or more later via in-person interviews. Establishment historians and politicians continue to bombard us with a whig history of Britain outlawing slavery in the 1830s, glossing over the forced labour camps it presided over 120 years later. Unfortunately the record of the left and ultra-left outside Africa has not been great either18. For those who identify as anti-imperialist, support has often been given to the colonised nation as a whole. This can lead to a focus on nationalist political leaders, giving less emphasis to internal class struggles and conflicts, in extreme campist19 cases supporting the new ruling class against the working class and peasant movements20, as long as they’re aligned against the US. On the other hand, what is often referred to as an international communist (or anti-anti-imperialist) position focuses on support for the working class against both colonial administrations and emergent internal ruling classes. However, by focusing on the tendency of national liberation struggles to throw up new bureaucratic capitalist classes, the class struggle that occurred against both the colonial and neo-colonial regimes has often been forgotten. Finally, these strike waves often took place a few years before independence, or a few years afterwards, so their contribution to decolonisation has been overlooked. When trying to re-assess this history for myself, I would often find at most one, maybe two articles online about major strikes involved tens or hundreds of thousands of workers. In many cases these have not been written by members of revolutionary groups but by academic historians. Even in those cases they often reside behind academic paywalls or in unpublished papers. For those of us without access to primary sources or academic journals, even knowledge of these events having taken place can be difficult to find. Over the past two years, I and several other libcom.org contributors have been slowly adding some of this history to our archive. This blog post does not add any new history, but attempts to collect some of these strands together, and to offer some directions for further investigation. The 1945-1950 strikes in the US, Europe and Japan were focused on extractive industries, manufacturing and transport. Colonised countries did not have strong manufacturing bases, but they had extractive and transport industries, to extract minerals and transport them to the imperialist countries. Even during the war there were strikes in the transport industry in Africa, with rail and municipal workers on the Gold Coast (Ghana) striking in 1939 and 194121. Soon after these strikes, the British colonial office sent I. G. Jones, a former Welsh officer of the NUM, to ‘organise’ the workers into formal trade unions. This was an early example of imposing the bureaucratic trade union structure of British unions onto African colonies in an attempt to normalize industrial relations22. Workers at the British state owned coal mine at Enugu, Iva Valley, who were locked out during the 1945 general strike, were to go on strike again in November 1949. Enugo was home to the Zikist independence movement, and the colonial administration sent in police accompanied by Hausa troops from northern Nigeria to remove explosives from the mine and quell the strike, as local Igbo constables were fraternising with the strikers. Nigerian coal had been strategically important during the war, and was important to the post-war Labour government’s rebuilding efforts. 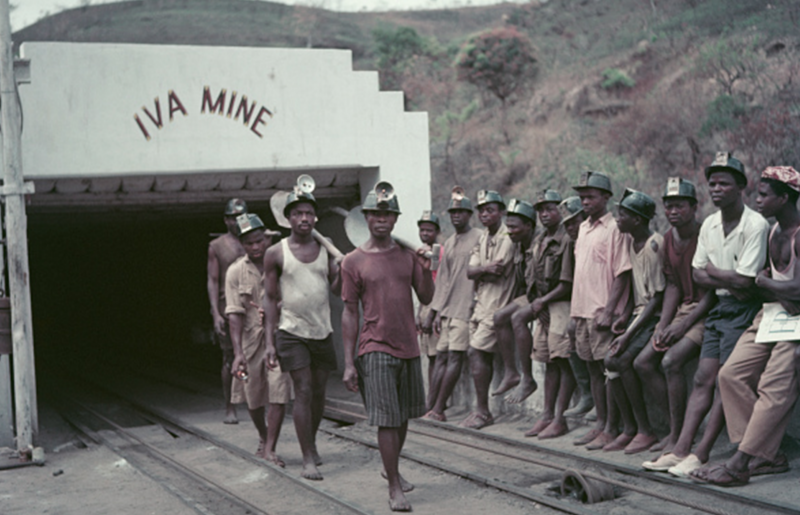 Some of the mine workers had been drafted into Britain’s colonial WWII forces, sent to fight in South East asian conflicts such as Burma where units such as the 82nd West African played a key but little recognised role in the conflict. Once again British Trade Unionists were sent to the area to ‘organise’ workers, although this was broadly rejected due to the strong political climate and self-organisation in Enugo. Five autonomous unions were created, the workers were sacked, then they occupied the mine. This was not a strike of miners for a decent living wage. Considering the cost of living and the background of Africa, I think the wages are fair for the work done. The strike wave returned to the East African mainland with the Nairobi General Strike of 1950, and strikes on the docks in Dar Es Salaam again. The strike in Dar Es Salaam was to reach a previous unknown level of violence, resulting in the colonial government banning trade unions. It was only in the mid-1950s that Julius Nyerere’s TANU party would emerge. Nyerere’s African Socialist Ujamaa ideology was opposed to strike action, stating in his 1962 pamphlet that ‘Trade Union leaders and their followers, as long as they are true socialists, will not need to be coerced by the government into keeping their demands within the needs of the society as a whole. Only if there are potential capitalists amongst them with the socialist government have to step in and prevent them from putting their capitalist ideas into practice!”30. By 1950 in Kenya, the Kikuyu insurgency had reached a level where the colonial administration was unable to enter some areas of Nairobi. Unlike some accounts of Kenya’s independence movement, the Kenya Land and Freedom Army, the Nairobi Tenants Association, and the syndicalist African Workers Federation were not aligned with Jomo Kenyatta’s nationalist political party the KAU, and Kenyatta in turn condemned ‘illegal’ strikes, as well as later being involved in the persecution of the ‘Mau Mau’ KLFA insurgents. The strike was not limited to the Kikuyu population though, with significant participation from Kamba workers and at least one imprisoned strike leader from Kenya’s Indian population, Makhan Singh. The strike took on an insurrectionary character, with a giant bonfire lit in the Kaloleni Valley with engine oil from Nairobi’s railway workshops. 4-5000 workers met daily for mass meetings, strikers formed flying pickets, and fought pitched battles with armoured cars dispensing tear gas and at one point buzzed by an RAF plane. The strike was sustained by food supplies from the hinterland31. The strike spread to towns beyond Nairobi via the railway workers, spurred on by a 20-year-old Indian worker Jarnial Singh Liddar. The Mombasa / Dar Es Salaam / Zanzibar / Nairobi cycle of regional struggles were not the only ones that crossed national boundaries. Around 8,000 Black workers on the Rhodesian railway struck in 1945 for higher wages33, this was one of the first post-war strikes of railway workers, which spread across the continent over the next fifteen years. Whereas the 1947-1950 strike wave in East Africa affected Kenya, Tanganyika and Zanzibar at different times, in 1959-1960 there was a co-ordinated strike of railway workers on the East African Railways and Harbours company. Beginning in Kenya, the strike spread to Uganda and Tanganyika. The strike began just as the State of Emergency in Kenya was ending and as the last remnants of the ‘Mau Mau’ insurgency were being dispersed. The Kikuyu-led insurgency had gone from work refusal by squatters 35 in the White Highlands, to the Nairobi General Strike, to being driven into the forests and guerilla warfare during the State of Emergency. The 1959-60 rail strike brought the focus back to industrial action but has been almost completely ignored in the history of Kenyan independence. In Tanganyika, during 1951–1955 there was annual average of 60 strikes involving 7805 workers with a loss of 11,183 man hours. This leapt to 146 strikes a year involving an average 59,457 workers with a loss of 483,521 man hours during the period 1956–1960, including its pinnacle the East African Railway Strike. The rail strike marked the highest point of a five-year period [1956–1960] where as much as 0.5 million man days were lost during each year. During the subsequent period 1961–63, the high incidence of strike actions was sustained though with fewer man days lost. There are similarly dramatic figures for Kenya, where almost a million working days were lost during 1961 alone, though less so for Uganda. The conflagrations came at a time when constitutional conferences least anticipated, or needed such external pressures. As with earlier strike movements in Africa, the British TUC and international organisations ICFTU and ITWF worked hard to undermine the strike action, attempting to make local deals in one section of the railway, in order to end the strike in other areas. The mobility of strikers and their ability to communicate directly undermined this though, and strikers in some areas were out for nearly four months. The unions were motivated both by Cold War concerns, and that the strike should not impact ongoing negotiations towards African majority rule, with Tanganyika becoming independent in 1961 (it was to join with Zanzibar forming Tanzania in 1962), Uganda in 1962, and Kenya in 1963. For a final example we come to one of the first post-colonial strikes, the 17 day wildcat strike in Ghana, 1961. Ghana had declared independence in 1957 under Kwame Nkrumah. Four years into his premiership, Nkrumah was on holiday in the USSR when the wildcat strike broke out in Takoradi-Sekondi. The railway workers of Takoradi-Sekondi had been loyal to Nkrumah in the years proceeding independency, organised by Pobee Biney since the late 1940s independent of the official trade union leadership, and they had supported the 1950 general strike as part of Nkrumah’s Positive Action campaign towards independence. As the 1950s continued, Biney was unable to unseat members of Nkrumah’s Convention People’s Party in the trade union hierarchy, and the railway workers observed the formation of a bureaucratic party ruling class, with TUC leaders driving Borgwarde cars around and CCP government officials getting noticeably richer at a much faster rate than wage rises. The rail workers were able to bring in port, municipal sewage workers and bus drivers into the strike, despite threats of arrests and military action by the government. Nkrumah removed some of the most corrupt government officials, but the strike also led to the strengthening of the TUC against the self-organisation of workers.37. Nkrumah, who was to deny class struggle whilst in office, later wrote ‘The Class Struggle in Africa’ which was in part a self-criticism of this period. The two strike waves summarised here, from 1945-50 and 1959-61 do not reflect everything that was happening in Africa at this time. This article has not dealt with Lusophone Africa: Cabral in Guinea-Bissau, the MPLA and UNITA in Angola, or Patrice Lumumba in the Belgian Congo. North Africa also saw significant experiments in self-management via factory and farm expropriations in Algeria in 1961-196238. Sierra Leone saw mass strikes and riots in 1955 in Freetown39 which does not appear to have a proper account40 and movements in Apartheid South Africa such as the Durban strikes of around one hundred thousand workers in 197341. In British West and East Africa, and French West Africa, the urban working class, considered a Labour Aristocracy close to the colonial administration by Fanon, led significant strike waves. Their strikes and militant self-organisation, often managed via mass meetings of thousands, threatened not only the colonial regime but also the smooth transition to self-rule nationalist political parties, although workers often fell in behind the nationalist parties at least until they’d achieved nominal independence. The strikes also bring into question the idea of ‘support’ for anti-colonial movements. Do you support the workers on strike, or the nationalist political parties that were condemning the strikes as illegal? The strikes threatened various smooth transitions to independence - directly imposed colonial rule became harder and harder to justify, while smooth industrial relations were essential to neo-colonial relationships being forged between former colonial countries, private capital, and the new administration. In some cases strike waves continued beyond independence, when the promise of national liberation devolved into IMF loans and austerity packages implemented by the nationalist leaders the same workers had supported previously. Our understanding of past movements can also influence our relationship to the present. The 2011 Arab Spring, mostly a ‘movement of the squares’ as opposed to industrial struggle, was nonetheless prefigured by a mass strike wave in Egypt in 200742. Recently Tunisia, the first revolution in 2011, saw another wave of strikes and street protests43, and there have been mass austerity protests in Sudan44. We see the legacy of these movements in the strike and massacre of workers at the Marikana mine in 201245 in South Africa under the ANC, echoing the massacre at Enugu mine in Nigeria sixty years before. Understanding the East African strike waves of the ‘50s could help contextualise the mass strikes of tens of thousands of workers in Kenya last year46, against the administration of president Uhuru Kenyatta. Just last week, striking students in Zimbabwe, in the midst of a month-long lecturers strike and work-to-rule were attacked by police with water cannons, dogs, and mass arrests47.